TAMPA—This convention has had its share of odd or unsettling moments on stage —the sight of a black ex-Democratic congressman happily playing the welfare card on behalf of his adopted party; the successful wedding proposal I witnessed this morning, when the cavernous hall was nearly empty. But I’m not sure anything on stage will be able to compete with the bizarreness of what came piped in from Kennebunkport Wednesday evening, a video paying tribute to the country’s last two Republican presidents—men who, as far as I can tell, have otherwise not been mentioned once in the prime-time proceedings, or even represented obliquely prior to tonight’s appearance by Condoleezza Rice. The banishment of the Bushes has become so expected that it seems to barely merit comment any longer. But it must be reckoned with, especially as regards Bush the Younger, who was president of this country for eight years really not that long ago (I have two young sons, and they were both born under the star of Dubya!). It is no mystery why the Republican Party moved to cut him out of the picture upon his helicopter escape in January 2009—subterranean approval ratings, an economy in ruins, and two wars gone badly wrong. What has gone insufficiently remarked upon is that the party has not moved to rehabilitate him several years into the presidency of a Democrat they scorn. One could easily imagine that the contrast with Barack Obama would set in motion the fine old loom of revisionism to spin some gauzy nostalgia for the good man who preceded the usurper. Yet that has not happened, which must be taken as a sign of just how sundered the bond is between Bush and the party that fell so hard for him in 1999 and 2000, and just how long a way the party has to go in grappling with what went wrong during his tenure. Where to begin. The Democrats will indeed “do it” for Clinton—as they did in 2008, and 2004. Eisenhower delivered a speech in ’68, which Bush is quite definitely not doing. And as for not eulogizing former leaders, there’s that one guy who the Republicans talk a lot about. What’s his name again? Is this true? Bush made no secret in the latter years of his tenure of his hope that his reputation would be redeemed in the long view of history, as has occurred for Harry Truman. But there was precious little evidence of an effort to encourage such a reassessment in that bizarre tribute video, which aired so embarrassingly early in the evening that I almost missed it among the parade of forgettable speakers. The video—in case you missed it, which you surely did—essentially flitted back and forth between Laura and Barbara Bush sitting beside each other on the porch and the two former presidents sitting together on a coastal Maine vista. The men spoke words of praise for each other, a poignant sight for any father-son pair but especially so in this case, when both find so little praise elsewhere; their wives offered recollections of golden-oldie moments like the time Barney the dog bit a reporter. 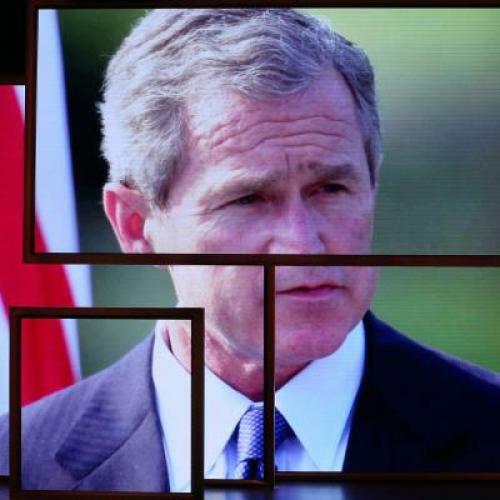 What was so stunning about the whole production, though, was what it left out: any real mention of anything George W. Bush actually…you know…did as president. There was an anecdote about his soulful friend Putin; there was a wistful remark by Laura that she hoped her husband would be remembered for his “determination…to see us through” after 9/11.” But that was pretty much it. Instead, there was talk from father and son about the “integrity” each of them had exhibited. It was a pure expression of noblesse oblige by the descendants of the family patriarch, Senator Prescott Bush—as if their task had been, above all, to preside over the country with the bland decency with which one ought to say, preside as chairman of a university board of trustees. And this sense of noblesse oblige was only heightened when they concluded the video by declaring that their fellow New England son-of-a-moderate-Republican powerboat-owner was up to the task of taking on the chairmanship, er, presidency. “There's no doubt in my mind Mitt Romney will be a good president,” said George 43. “He’s a good man,” said George 41. As if members of even their own party still believed, post-Bush, that this would suffice.